During the week before graduation, you’ll likely be juggling parties with friends and toasting with family. For a lunch to recover from a wild night out, head over to Duke’s Grocery on 17th Street NW. Celebrating Commencement and popping champagne — as well as other boozy beverages — go hand-in-hand. During the week before graduation, you’ll likely be juggling parties with friends and toasting with family, now that you can legally drink together. Your last wild nights as a college student will probably be spent heading to your go-to spots that hold the blurriest memories from the last four years. So check out these places where you can clink glasses and grab a bite to eat before or after those crazy nights out. Kick off a day of drinking with a long, bottomless brunch on Saturday morning. Brunch is an essential part of D.C. living, so get your family in on the action or have a last brunch with friends at La Tasca. At La Tasca, you can choose from classic brunch cocktails like mimosas and bloody marys or try a house-made white or red Spanish sangria that is strong enough to prepare you for a day of partying. This isn’t technically a bottomless brunch, but at $2 a glass, you won’t think twice about going in for round two, three and even four or five. To soak up the affordable booze, you can get three tapas for $22. The tapas-style menu lets you and your family or friends sample many different dishes. And you’ll likely order your tapas in three sessions, so you will have ample time to catch up with family and reminisce with friends about your time at GW. Grab a seat at one of the communal wooden tables and benches outside of Duke’s Grocery for the perfect hangover cure and a little tail of the dog with more drinks. Just a few blocks from Dupont Circle, Duke’s Grocery has a unique menu with ingredients like garlic aioli topping many of the dishes and even chicken liver making an appearance on a sandwich. If that makes your already-queasy stomach churn, then you can stick with the mac and cheese slathered in truffle oil served in a mini skillet ($10) or a hearty sandwich, like the proper burger ($12) or the posh B.L.T.A ($12), which has the perfect amount of fat from the bacon and avocado to help you recover. The tall and refreshing blackberry bourbon lemonade ($11) packs a punch and is the perfect way to ease yourself into continuing the party. Best of all, Duke’s Grocery has a happy hour that starts at noon featuring $5 beer, wine and select rail cocktails, so you can toss back a few drinks at this bustling hipster joint, even if it’s barely past breakfast. Head up to Shaw for happy hour and dinner at Takoda’s spacious rooftop beer garden that boasts spectacular views of the city. The prime location is situated amidst the U Street area nightlife, making it an ideal starting point for either dinner or a few drinks before heading out to bars later in the night. Take advantage of the Monday through Thursday happy hour specials from 5 to 7 p.m., which include $4, $6 and $8 drink specials. Takoda boasts 24 craft beers on tap and 70 whiskeys and bourbons, so there’s something for everyone. The timing of happy hour is just as the sun is going down, making Takoda the prime rooftop destination to wow out-of-towners. Fake ivy and criss-crossing twinkle lights swoop above the large bar atop the restaurant with indoor and outdoor seating, giving it an upscale yet relaxed feel for family, friends or both to sip a few brews side by side. After you have partied away all the stress from four years of school, head out for some late-night drinks at Service Bar, which is open until 3 a.m. Fridays and Saturdays. 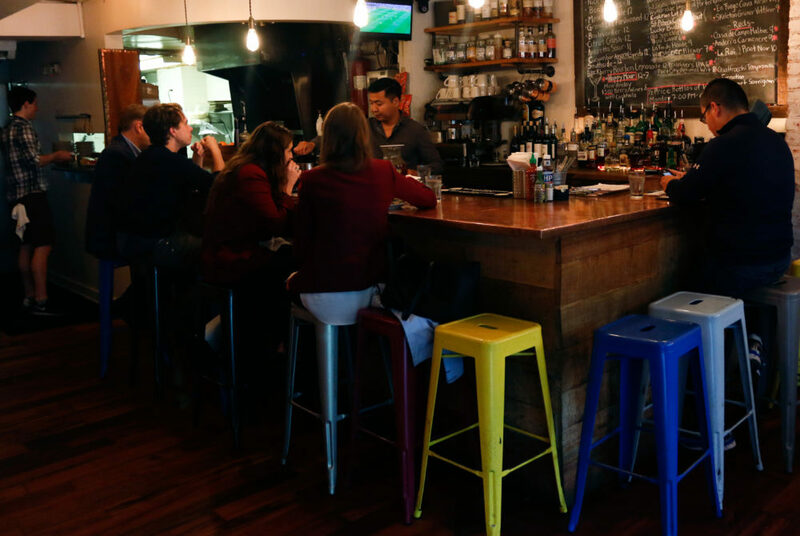 Inside this tiny, cozy bar you can sit at one of the six tables for two or at the bar. The menu is filled with drink categories like “dope wines of the week” and “drinking champagne and writing checks we can’t cash,” which showcase the vibe in this off-beat basement joint perfectly. The menu ranges from the Samantha ($13), a sweet pink cocktail of vodka, cranberry juice and citrus juice to cheap and easy beers. Hearty fried chicken dishes – like chicken tenders in a waffle cone – will satisfy all your drunken cravings. The noise, dim lighting and small tables make it best suited for a nightcap after a night of bar hopping. If your parents are traditional, you should send them home before you head out for a final cheers with your friends.